OUR ROOMS are fully air-conditioned, and equipped with cable television and wireless internet. For travelers with children, the Inn offers family suites, which consist of two connecting bedrooms and a private bath. RATES range from $119.00 to $259.00 per night. $15.00 per night additional charge for extra guest. No charge for children under 10 years of age in a family suite. Inquire about our five day mid-week special. A DEPOSIT of 50% of your stay is required at the time of reservation, with balance due upon arrival. Full refund for cancellation with a 14 day advance notice, less a $25.00 processing fee. CHECK IN is 2:00 p.m., checkout is 11 a.m. Private bath, queen bed, pillow top Beautyrest mattress, newly furnished 2013. Located on the second floor. Accommodates two adults. This suite can accommodate a small child on the pull out mattress located under the bed, floor space limited. Queen bed, private bathroom. Located on the second floor. Newly furnished 2013, includes a Beautyrest pillow top mattress. Accommodates two adults and one small child on the pull out mattress located under the bed. Queen bed, private bathroom. Located on the second floor. This room can accommodate two adults, and a small child on the mattress located under the bed. Newly furnished July 2013, pillow top Beautyrest mattresses. Two connecting rooms each room containing one queen bed. Private full bathroom. Parents may sleep in one room while children may sleep safely in opposite room with connecting door. 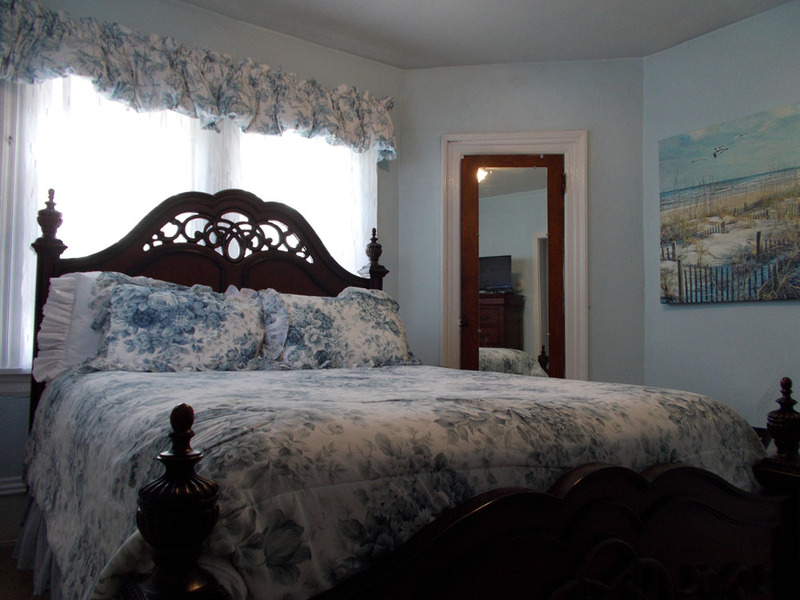 Room renovated 2013 with new furniture, mattresses, windows, bath. Two connecting rooms. Dormer room has queen bed, opposite room has single bed and full bed. Private bath is located inside of the suite. This suite is located on the third floor. Master bedroom has king bed, children's bedroom inside of the suite has triple bunk beds (single on top, full on bottom), extra cot, and full size crib. Private bath inside of the suite with bathtub/shower. The master suite is located on the third floor. Two bedrooms with a connecting private bath. First bedroom has one queen sized bed. The second bedroom has two full sized beds. This suite is located on the first floor - off of the kitchen. Original servants quarters to the home.